Regarding the appropriate Bracha, the general rule for a dish with numerous ingredients is to make a Bracha on the primary ingredient (the Ikkar), and not to make a Bracha on the secondary ingredients (the Taffel). 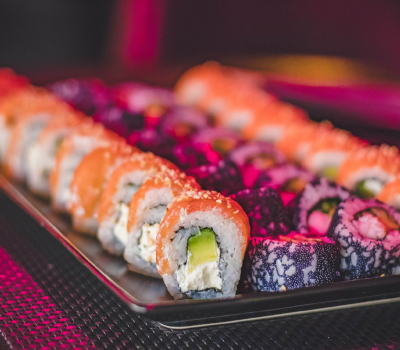 The varieties of maki have different names depending upon the filling, which is generally not considered by the consumer to be secondary to the rice. Irrespective of the filling, the food is known as sushi due to the rice; it appears that the rice is not secondary to the filling either. Furthermore, the filling and the rice are not cooked together, and remain distinct. Therefore, both the filling and rice are primary ingredients, and both necessitate a Bracha. For this reason, Rav Heinemann paskens that one should recite Mezonos on the rice, as well as the appropriate Bracha on the filling. The nori (seaweed) is secondary to the rice and other ingredients, and does not require a Bracha.